Well what can I say, despite the tricky fishing for the trout lately there has been some truly quality back end sport reported. Our long standing Brown Trout record of 10lb 13oz has been obliterated by Paul Little with a fantastic fish of 12lb 7oz. Paul caught and safely released this fin perfect fish while boat fishing with a Heddon Lucky 13 lure. Well done Paul, this fish couldn’t of fallen to a better angler. (see attached photo). 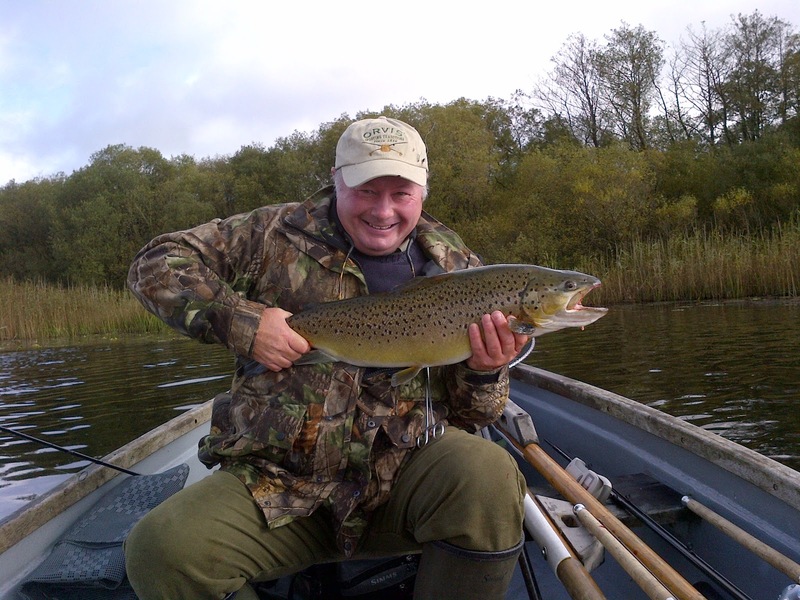 Hawkshead Angling club member Dave Margerson bank fished the top end of the lake and recorded Brown Trout of 3lb 8oz and 9lb respectively on spinner. Both fish were released safely. Meanwhile Dave Smith from Milton Keynes fished from the boats and reported a Brown Trout of 10lb exactly, which fell to a Savagear spinnerbait. Again the fish was safely released. (see attached picture). Visiting angler Graham Howarth from the U.S.A landed a brace of brownies while employing a mepps spinner from the boats. Grahams best fish was 1lb 8oz. Fly angler Geoff Wilkinson from Hertfordshire took 4 brownies from the boats to 2lb +. A combination of minkies and daddies did the damage for Geoff on a floating line. Adrian Trumper from Lincoln took 3 brownies to 1lb 8oz on floating line and nymph combination. The well fed Pike which reside in this venue have been tough to catch recently, however for those that have persevered there have been some crackers reported. First up Big s club member Chris Harris fished 2 days from the boats, employing deadbaits and lures and recorded fish of 21lb and 20lb, plus 12 doubles to 18lb and 2 jacks. H.A.C member Tim Carswell fished from the banking up the North end of the lake and took a plump 16lb 12oz specimen on static deadbait. Meanwhile Ryan Burrow from Windermere took a 22lb specimen on static sardine from the car park banking. Richard Walsh from Stockport hired the assistance of one of the Esthwaite guides to land a personal best 19lb 8oz beauty, again on static sardine from the boats. Also Steve Greenhalgh from Wigan boat fished and took a nice brace of double figure Pike of 13 and 14lb respectively, again on similar deadbait tactics. Fish of the season so far at 32lb fell to Gavin Dickson from nearby Burton in Kendal. He cast his lure from the boats and had a very big fish follow to the side. The fish turned and instantly took his static herring deadbait. Well done Gavin , that’s a fish of a lifetime, and a personal best. Who knows what this fish will weigh in March! (see attached photo). Don’t forget our general coarse fishing season starts on the 1st November and runs until the end of February. This gives anglers a crack at the untapped silver fish potential of the lake. Tickets are £10 per day and anglers can use 2 rods and maggots. Last winter 20-30lb bags of fish were not uncommon. Please telephone the ticket office on 015394 36541 for further details. Also you can find us on Facebook or follow us on Twitter! The trout fishing continues to be good for the time of year and despite the heavy rain that we have experienced lately, the water clarity is excellent. As the water cools throughout the autumn oxygen levels will gradually rise again and prospects for the next few weeks look very good indeed – weather permitting of course. The trout are rising freely for tiny buzzer, however matching the hatch is almost an impossibility. There are a few sedges coming off the lake, so best target rising fish with a sedge pattern, daddy long legs or hopper. However the favourite and most successful tactic has been to find the fish and employ fry patterns on an intermediate line for best results. One angler that did just that was Will Pollard from Cheshire. 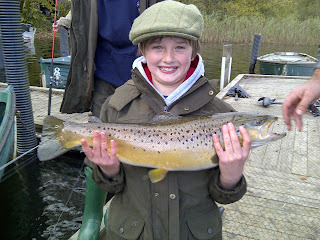 Will fished from the boats and landed 3 nice Brown Trout. Andy Bailey from Fleetwood also fished from the boats and landed a brace of brownies on spinner. Also fishing the spinner, season ticket holder Joe Reynolds from Barrow in Furness landed 3 brownies from the boat jetty. Meanwhile Charles Davis from Dorset also took 3 browns from the boat jetty on a small rubber fry imitation. Kevin Totterdell from Manchester fished worm from the boats and landed 2 rainbows and 2 browns to 3lb+. Martin Frood from Frodsham took advantage of the fry feeding frenzy. He employed spinner and landed 3 brownies, the best a cracker of 6lb (see attached photo). Another Big s club member Reece Nicholson from Carlisle also used static Herring and landed a 16 pounder from the bank opposite the ticket office. Meanwhile John Stapleton from Penrith fished a variety of lures from the boats to take 6 Pike in total, 3 jacks and 3 doubles to 19lb 8oz – Good angling! Hawkshead Angling Club member Tim Carswell from Cockermouth has landed a number of Pike from the banking, all on static deadbait. Tim’s top 2 fish weighed 21lb 13oz and 24lb 7oz respectively (see attached photo). Also Big s club member John Ashurst from Wigan lure fished from the boats and had a number of Pike up to 19lb+. The prospects over the forthcoming weeks for the Pike fishing looks excellent. 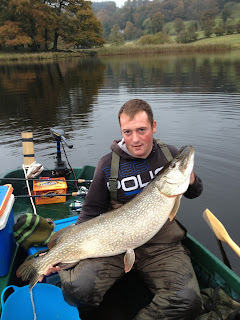 As the trout stocks thin out the Pike fishing will get better and better. To keep in touch with the fishing on a daily basis please follow us on Facebook and Twitter!